I got the ghost mate protein skimmer and am just using the sock for filtration. Where should this Media rack go??.. I am not fully understand the purpose and necessity of it.. The media basket goes in the 1st chamber (where your overflow is). In the IM 20 I think you actually have 2 of these chambers. It is a method of directing your water through a variety of filtration media. Typically the first layer will be filter floss to physically remove any detritus and prevent it from being suspended in the water column. After the filter floss is where people diverge on what they put in the media baskets. I run mine with chemi-pure elite, then purigen. I run the chemi-pure elite for carbon/gfo, and then the purigen is a resin based filter media that absorbs organics before they can break down and pollute the water. 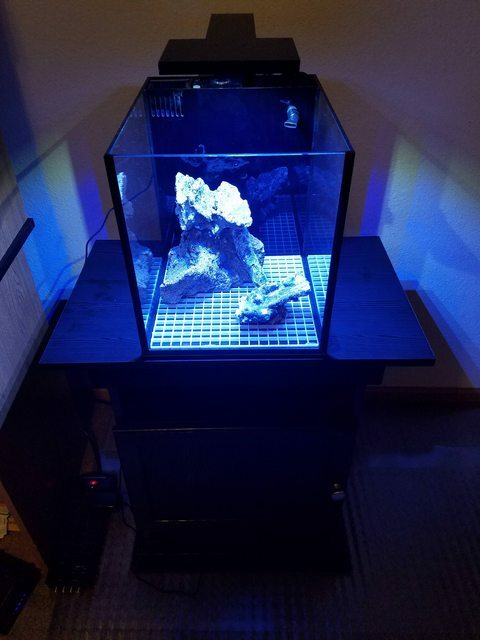 I'm currently cycling my 10 gallon nano with uncured gulf live rock. 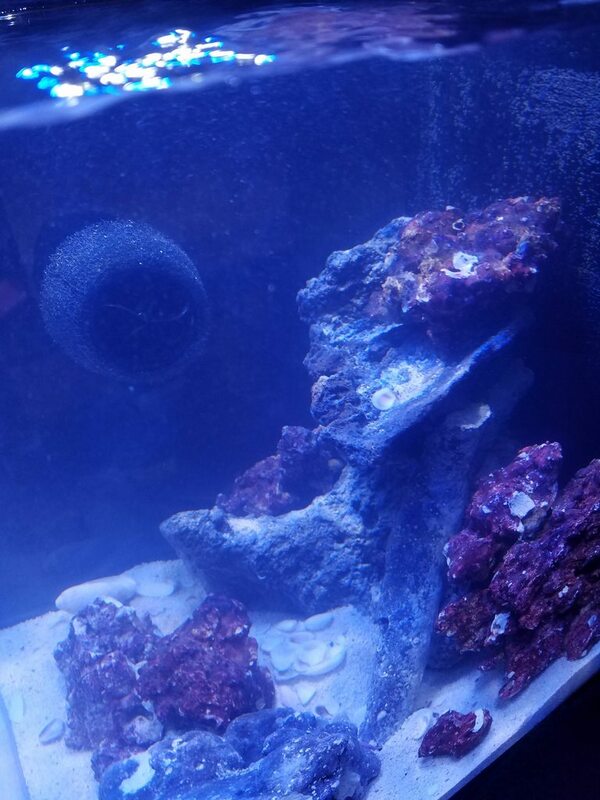 Had a couple of sponges and barnacles die on me giving an ammonia spike, but it's been a week and a half and my levels are starting to drop. No more dead stuff and the LIFE is amazing. Copepods, amphipods, snails, a hermit, tunicates, feather duster worms, encrusting sponges, macro algae, spionid worms, limpets, different colors of corraline, and baby cup corals. I also got a harmless little sea slug that has been eating pods, a pistol shrimp that I've only heard, and one or two TINY gorilla crabs that I'll trap out eventually and throw in my fuge. And that's just all I can see with my eyes. The microbial biodiversity must be insane. "Don't ever think that self-interest is wrong. Self-interest is survival. Self-interest is the substance of life." All the rocks are held together and to the plastic base using Oceans Wonders epoxy putty for those wondering. 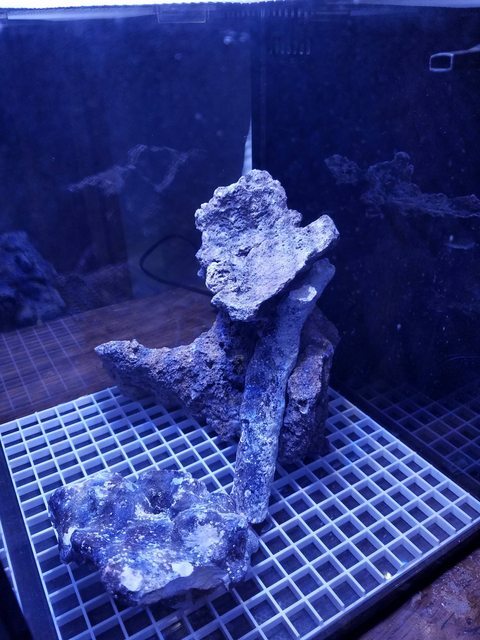 My LFS has vats of live rock so I will have to go hunting for some good pieces that will fit into the rock work, I'm hoping to add some sort of hiding spot towards the rear right so I'll be looking for rocks to add that effect. After the stand comes tomorrow I'll put it together. Once stand is set to go I'll get water in with the arag-alive and everything running on the tank. 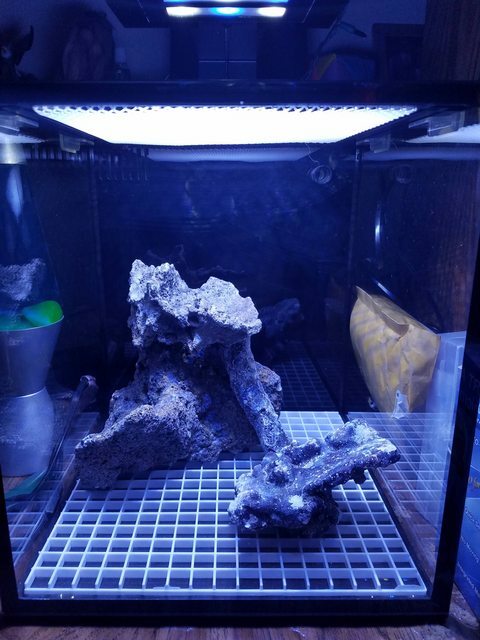 How long should I run the tank with just the base rock and arag-alive? Do I need to add anything to get the bacteria on the arag-alive to start working? Last edited by K-Dubbs; 11/07/2017 at 09:06 PM. Tank stand is put together! Going to be adding substrate and water next! 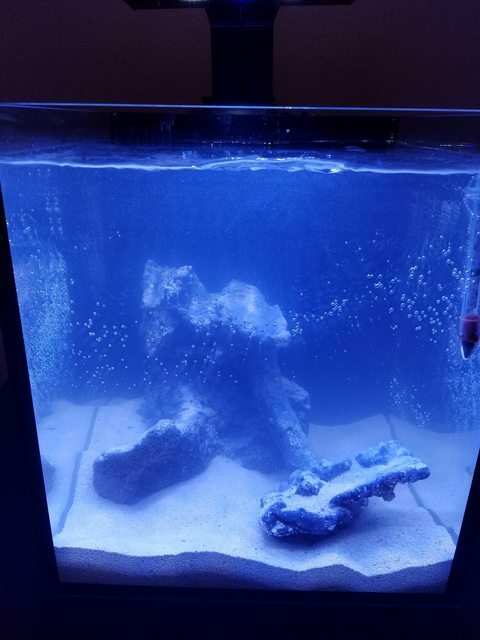 Sand and water are in, still a bit cloudy but took some pics anyways. Next to add some liverock! 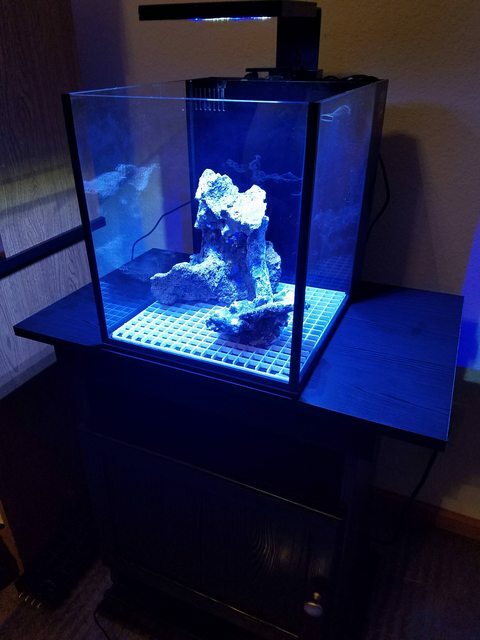 Added the live rock. 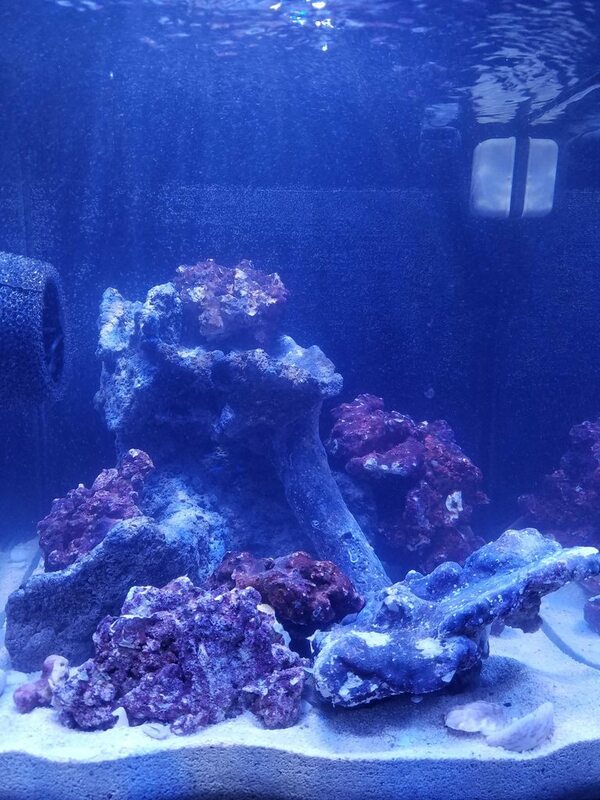 May have gotten a bit more than intended, but I can always take some out later for aquascaping and as I add corals. Also added on a vortech powerhead. Last piece of equipment to get up and running is the ATO. Will get the ATO up and running soon as well as doing fishless cycle for the next two weeks with Dr. Tim's Ammonium Chloride solution. Once the tests are good after that I will add some livestock! I'll also update with pictures once the water clears up some more, still a bit cloudy/bubbly. Contemplating a pistol shrimp/goby combo, they were really fun to watch in my last tank and having them in here would be nice. 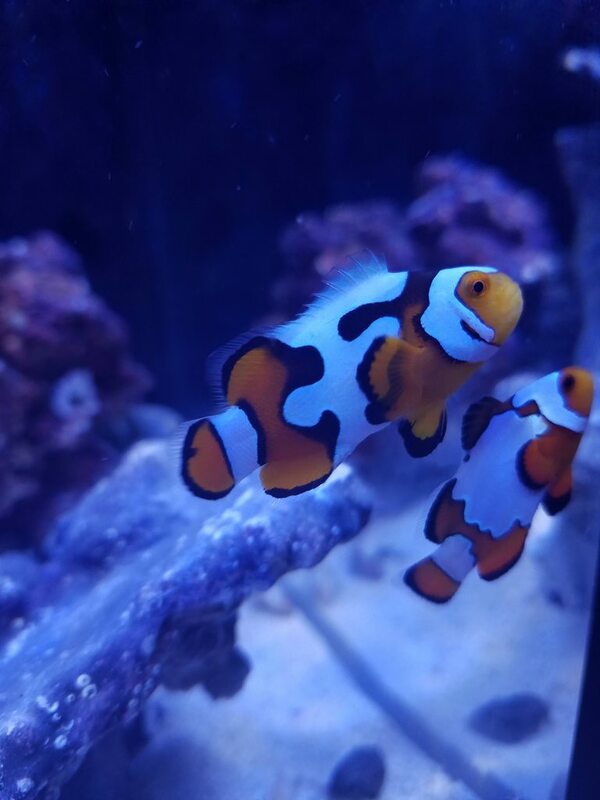 I am still thinking of going with a cool colored pair of clownfish. I really like the snowflake/black ice or gladiator colorations of clowns. 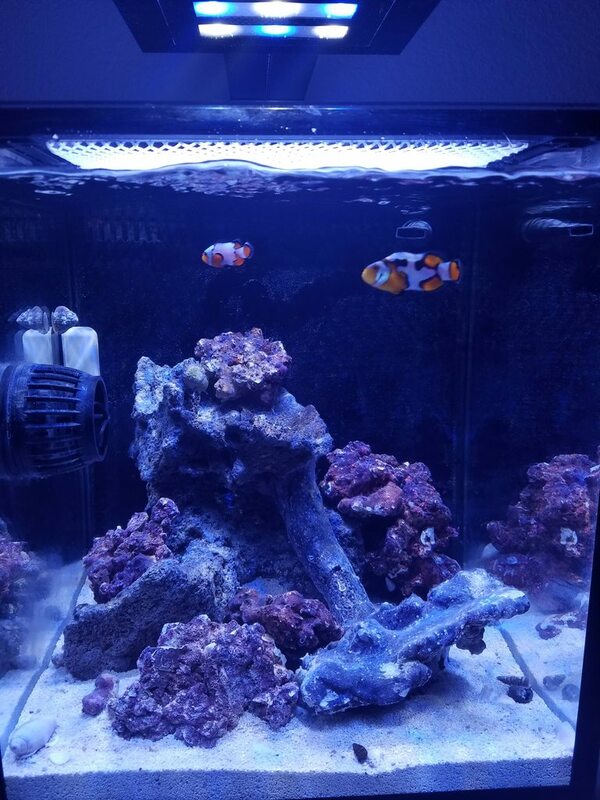 If I do get clowns, what is everyone's opinions on anemones for them? Are they too much trouble? 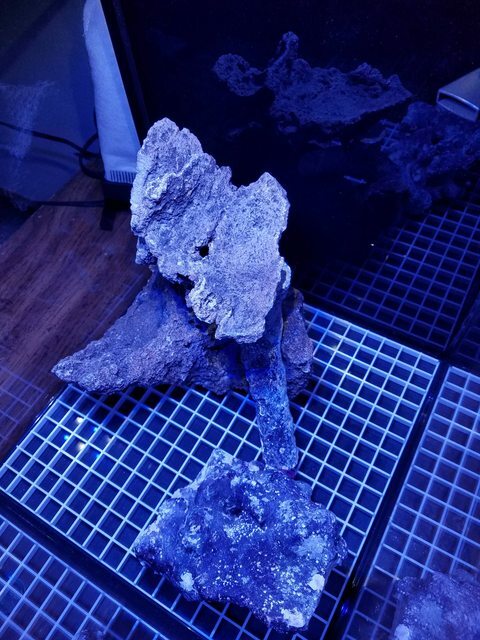 Will they push out all the corals and grow too big? 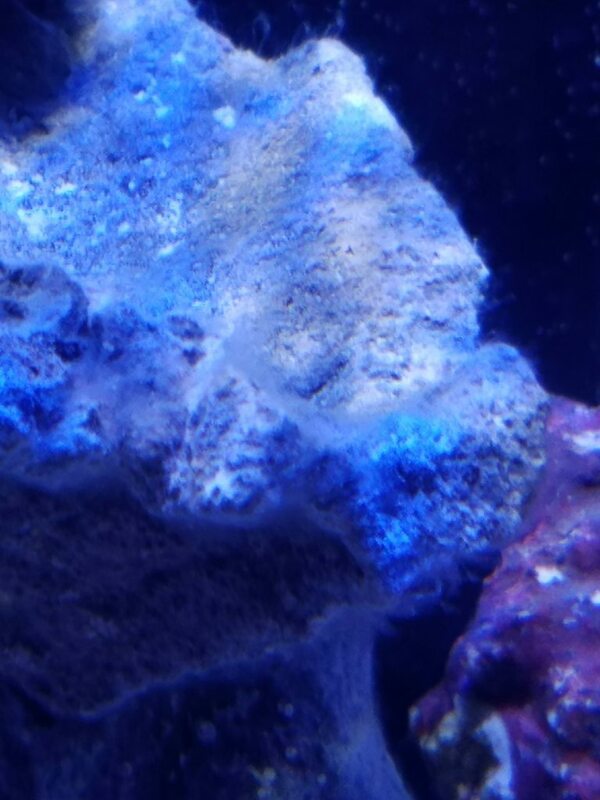 Am I better off just getting a LPS coral that will act the same way for the clowns? Mandarin Dragonettes used to be pretty much impossible to keep but my LFS has a few that are eating frozen mysis. Are they possible to keep if that is the case? Looks like tank is cycling, will continue to dose dr.tim's each day and monitor levels. Looks good! I would advise against the mandarin. Even ones eating prepared foods still need live food. Frozen is a supplement only really. That's what I was afraid of. Oh well! pH seems to be on the low end, possibly due to the bacteria using up a lot of the oxygen? nitrite and nitrate have gone up, will let the system go without dosing for a day and check again levels tomorrow. Going to do a water change today. Do another dose of the Ammonium Chloride and do more tests the next two days, but it is looking like my cycle is coming to an end. Hopefully I will be adding livestock soon! Tanks looking good so far! 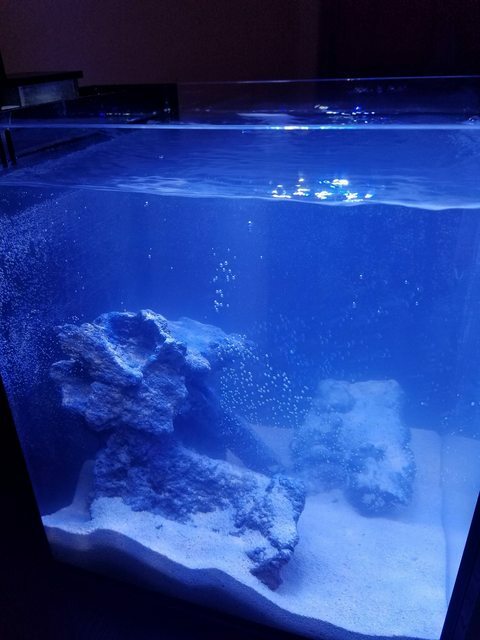 I recently started a new tank, a Nuvo 20. 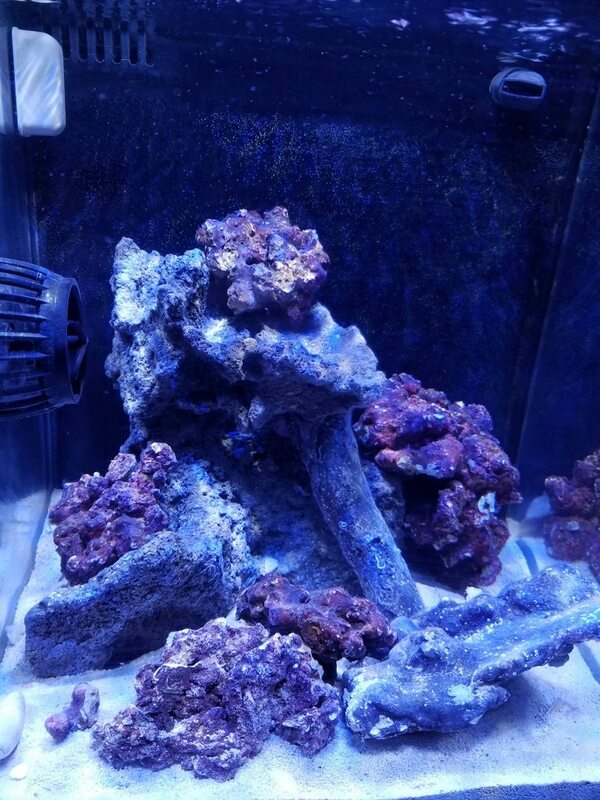 I had a candy-cane pistol shrimp/black-ray goby combo in my Nuvo 40. 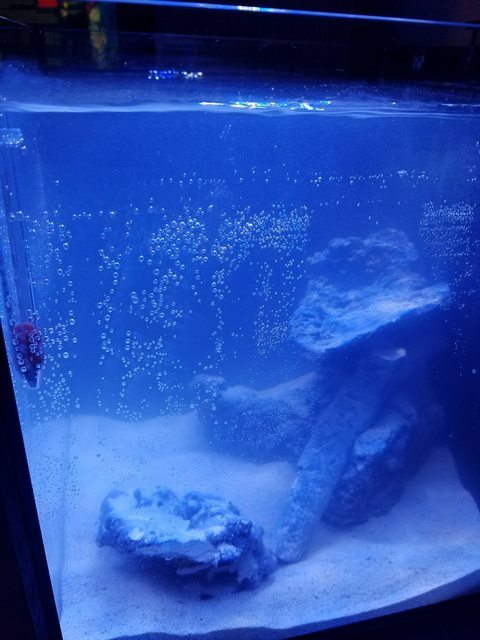 The second day The Goby was no where to be found and the pistol shrimp had a huge maze with openings under everyone of my rocks. I never saw the pistol shrimp unless I shined a light into one of the holes. I always heard him though! 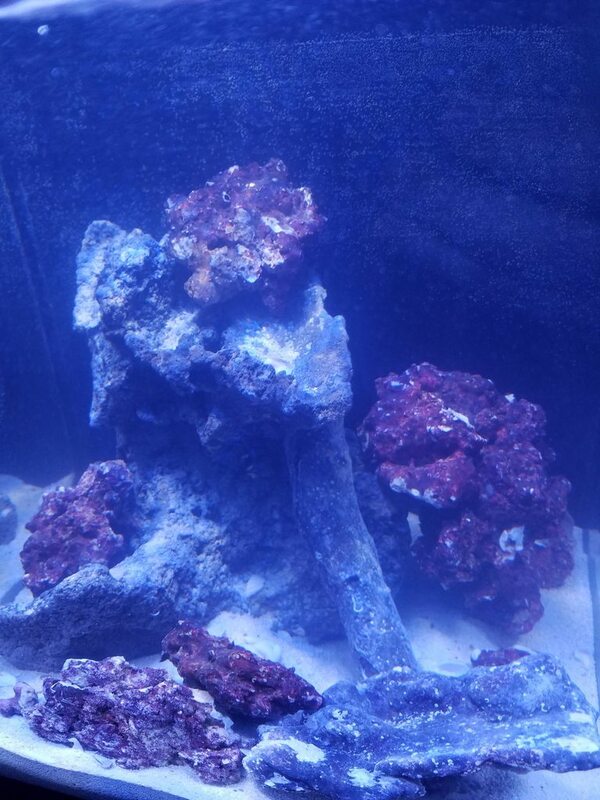 For my nuvo 20 I ended up getting a sweet deal ($15) for a Grade A Davinci at petco! This black friday I also picked up a nice $30 snowflake & they get along great! I contemplated making the tank an anemone/clown only tank but decided I wanted to pack it full of LPS and SPS. 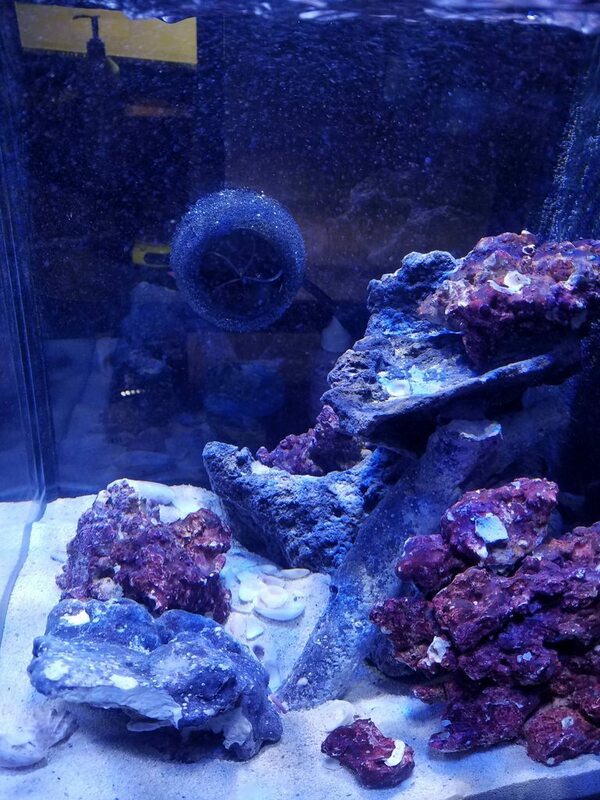 I don't really care to mix anemones and other coral after having a large green bubble tip walk all over everything in my Nuvo 40. I've also read too many horror stories of them walking into powerheads! As for a mandarin I'd say wait until you have a large and healthy population of pods (in 6 months to a year) even if the LFS says its eating frozen. I think I will be skipping the anemone and the mandarin. I got myself two clowns and a few snails and hermits! May still add a goby/shrimp combo down the road. Going to probably find a nice LPS to substitute as an anemone for the clowns. I will just have to keep my eye out! Here is a few pics of the clowns! 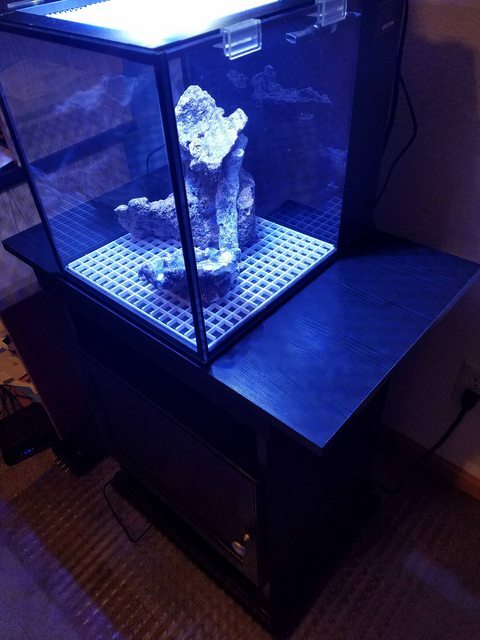 I will be setting up a new tank myself in a few weeks. I have a Fluval Evo XII on the way. 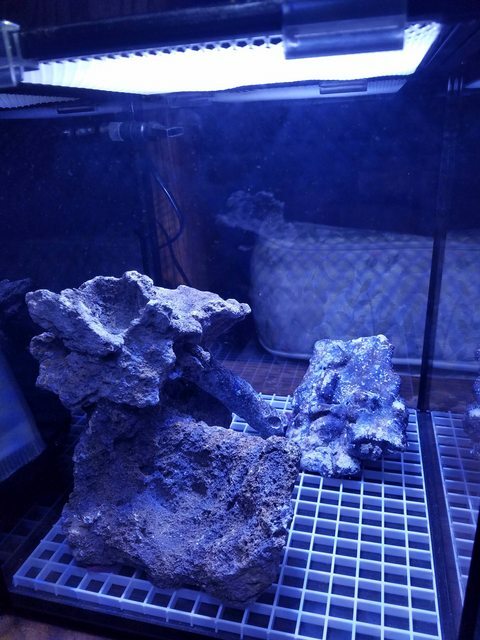 I still have a 40 breeder with quite a bit of coral in it but it's in my basement. I need something on the main floor to look at. That tank has been without fish for about a year now. Hoping to get a clown pair myself. Awesome! 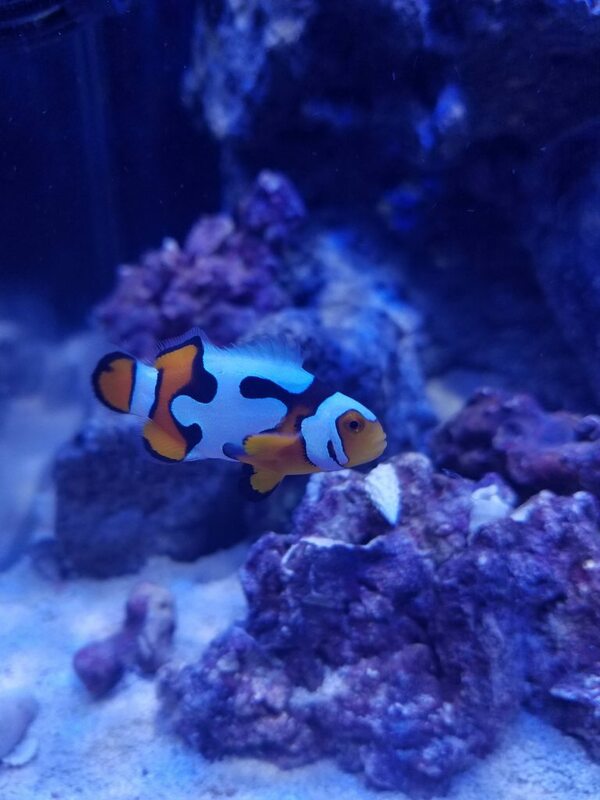 These guys weren't hard to find, I picked them out of a tank with about 40 clowns in it. All different variations of snowflake/picasso. Going to do another water change in a few days. Possibly add some zoa's or mushrooms if I find something in colors I like. With such a small tank I have to be picky! I'll also probably pick up a few more test kits. Phosphate, Magnesium, Calcium and alkalinity/hardness. The clowns are doing well, active and hungry. Right now just feeding with spectrum pellets. Hoping the pellets will help keep the excess waste down, whenever I fed frozen before it always seemed like there was a lot of waste that went into water. Was thinking on sometimes feeding other things, anyone have any suggestions? 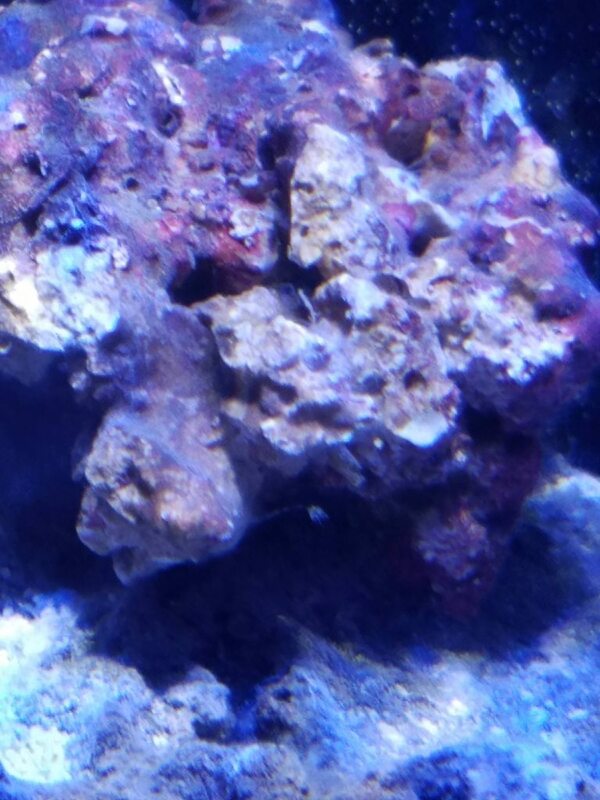 Also going to start keeping an eye out for a suitable coral to substitute for an anemone for the clowns. In my previous tank a frogspawn worked well for that, any other suggestions? Torch coral. Nice long tentacles like an anemone. Thanks for the suggestion! 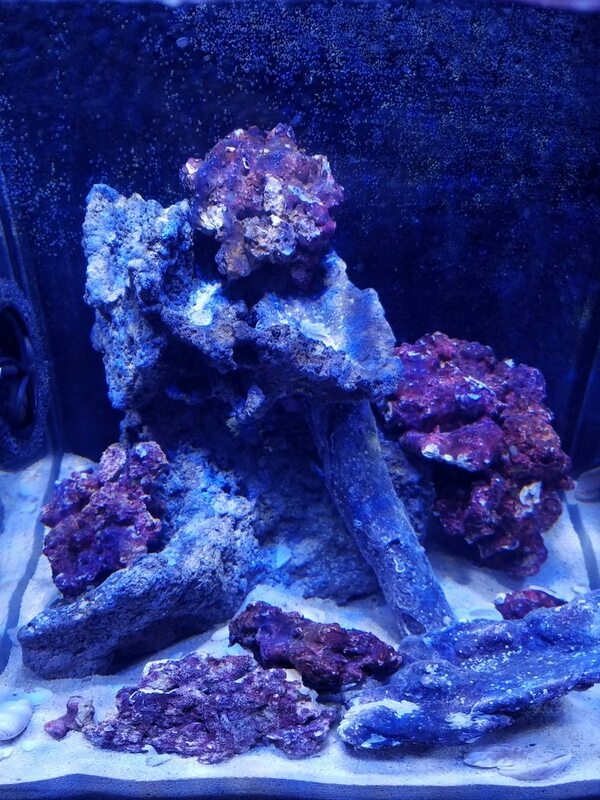 Torch corals do look pretty nice. Have to keep my eye out for a nice one.